There are many published studies for tunas, and all related scombroid fishes, that indicate that there are distinct physical boundaries that, although permeable to varying degrees, appear to inhibit major abundances or aggregations of schools, individuals, or some size groups within a given species (e.g., Sharp & Dizon, 1978). Acoustic tagging studies (e.g., Carey & Olson, 1982) of the behavior of individual scombroids while free swimming in the open ocean show clearly that they exhibit differential swimming depth and feeding behavior patterns during day and night that provide the backdrop against which all fisheries operate. It cannot be assumed that ocean gradients have their own unique effects on the behavior of these species without regard to the absolute temperatures comprising those gradients, the size and thermal histories of the fish, and their motivations for entering, for whatever periods of time, any variously inhospitable environments. The basic premise is that, wherever there is sufficient oxygen and non-limiting temperatures from the emergent 15° isotherms bounding the poleward regions of the subtropical oceans to the equator, it is nearly impossible to find an area where, fishing long-line or trolling a feather lure, one will not catch at least one species of tuna at some time over the seasonal cycle. Moving toward the equator, the number of likely encounters increases, as do the numbers of species to take the hooks, given that the baited hooks are fished within well-oxygenated waters. Even beyond the thermocline where temperatures at hook levels decrease to well below 10°C in the tropics, larger and diverse species are likely to be caught (e.g., bigeye, al-bacore and bluefin species as well as billfishes). I will also identify here the less predictable "sufficient" conditions. These include responses to dynamic habitat characteristics such as salinity, food aggregations, and reproductive opportunities that are scattered over broader spatial and temporal bounds. The difference between the sufficient conditions and the necessary ones is only a matter of the length of time that individuals can tolerate continuous exposure. For example, below certain food encounter rates, an organism cannot continue even at optimal temperature; likewise, even short exposures to very low temperature or oxygen levels can be devastating. However, critical values of oxygen and temperature for sustained exposures change with species, size, and developmental stage. Tunas and their relatives have evolved characteristics that extend their capabilities to pass beyond these critical physical boundary conditions, but they cannot survive these exposures for long, indefinite periods. That distinction makes their behavior even more predictable than the less-adapted species; that is, because they are so energy-consuming, they are dependent on ocean processes and features which promote the aggregation of the prey resources which they must find within finite time periods, or die. These are the fronts, thermoclines and productive shoal regions of the ocean. Clearly, even the most primitive models of behavioral responses to such conditions as food aggregations and thermal preference limitations will show that the place to search for such species is at the interfaces of the ocean, where similar processes, on smaller scales, promote aggregations of entire food webs over time. The proximate causes of these physical features are quite relevant, as these are mostly related to surface winds, current impingements, convergences and divergences related to physical, remotely forced processes. Storms, strong wind events, and current impingements can also be looked upon as being analogous to plowing fields, turning over fertile, productive strata, providing for rapid food web development, and subsequent predator aggregations. The Indian Ocean is a patchwork of seasonally varying surface wind dynamics, and resulting physical features and processes (Hastenrath & Lamb, 1979). Between the monsoonal seasonal and interannual dynamics, and the longer-term epochal variations of the region, there are many significant sources of ocean current dynamics. This is the key to the success of the Indian Ocean surface tuna fisheries, including the subsurface long-lining for large tunas, billfishes, and other predators which also dominate the region. Climate-driven ocean variabilities are important on daily, seasonal, up to epochal time scales, depending on whether one is trying to plan for the next decade's investments in infrastructure, next season's orders for canning materials, or tomorrow's fishing day. The patterns of change are only now becoming apparent, and the year-to-year ocean variability in some regions can be as large as the decadal differences in others. Yet seasonality dominates all scales, resetting to some degree the anchor points from which to do short-term, annual comparisons, and relevant economic planning. There are certain dependable properties of each of these systems which provide the basic underpinnings of successful tuna location, if not abundance estimations. Optimization of surface tuna fishery catch rates depends upon the "local" characteristics of the broader habitat limits related to prey densities and aggregation phenomena, as functions of ocean production features. In response, fishermen (and sea birds) have, generally, learned to operate in the vicinity of frontal discontinuities of any sort, as a necessary adaptation to the difficulties in locating food aggregations in the open ocean. With the onset of satellite-based observations, the location of "features" has become far more efficient. The use of bathythermograph equipment, such as the XBT, along with near real-time satellite imagery, can pro vide the bases for efficient subsurface feature location and, hence, optimal fishing success. Characteristics which appear to improve catches for surface tuna fisheries include shoal habitat limits and strong vertical thermal gradients, as well as proximity to the surface emergences of these features in the form of fronts and transition zones. Understanding is often confounded in studies employing only thermocline slope and sea surface temperature (SST) as major proxy variables. The single most abused diagnostic variable is SST, which is nearly irrelevant to tunas since they do not really spend much time near the ocean surface. 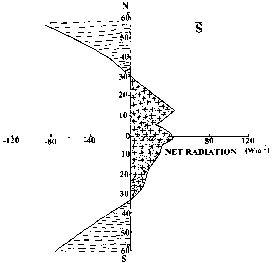 Scalar wind records (Fig. 16.2) provide useful integrations of strong forcing functions which affect the upper ocean and, hence, tuna vulnerabilities. Greater surface winds indicate stronger upper ocean mixing, and deeper thermoclines; lesser winds provide less mixing force, and promote shallow tuna habitat, hence greater accessibility of the schools to surface fishing techniques. Fig. 16.2 The comprehensive ocean and atmosphere data set (COADS) scalar wind data show the long-term changes in surface wind speed (m/s) and their deviations since 1854 for the Northern Hemisphere from the equator to 30°N. Note the large changes that center around 1875, 1900, 1915, 1925, 1940-45, and 1955-75. Many still argue the basis for these statements from academic perspectives. Speaking empirically, however, the obvious successes in ocean fishery developments and harvest strategies, which employ the basic logical concepts revolving around species and size-specific physiological requirements, belie research results and commentaries about tuna fishery responses to the environment arising from poorly conceived environmental correlations or statistical tests that often examine perhaps only half the data required for meaningful analysis. Surface and subsurface features, for example, thermocline properties, oxygen availability, local and regional gradients and dynamics, along with consequential prey responses, constitute the necessary information for understanding the behavioral dynamics that can lead to a successful tuna fishery. Even vessel origins, crew compositions and differences in fishing behavior (and esotérica such as a vessel's historical economic or maintenance information) can provide needed insights into catch efficiency (catch per unit effort - CPUE). The following contrast that can be made in the available data from the western Indian Ocean fishery provides an interesting point of departure from theory and principles, to practice.